James Vell “Baby” McGhee, a native of Arkadelphia, Arkansas, was born to Matthew McGhee and Arlissie Johnson Franklin. He moved to Amarillo at a young age and attended Amarillo Public Schools. He was a graduate of Carver High School and was a football running back standout. James received five letters during his football years that he proudly wore on his Carver Dragons jacket. 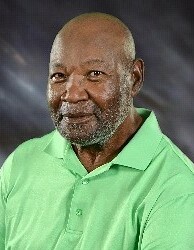 He was a member of the Football State Championship Team in 1952. He wore Jersey No. 25 which his great-granddaughter, Tayjanna now proudly wears. James was also a boxing champion during that same time period. After high school, he met and married the love of his life, Willie Jean Jones; and he took her on a world tour while he served his country. James retired from the United States Army as an Air Defense Artillery Sergeant First Class, where he completed over 20 years of service. While in the Army, he became a Missile Team Leader and was Nuclear Certified. His military honors include the National Defense Service Medal OLC, Good Conduct Medal, 1st, 2nd, 3rd, 4th and 5th Award, Armed Forces Expeditionary Medal, Ex-Badge M-14, NDSM, six Service Stripes, two Overseas Service Bars and an Army of Occupation Medal. James was a long-time member of Jenkins Chapel Baptist Church, where he served as a Trustee for over 15 years and made many contributions to his church as well as his community. He was a member of Markwell Masonic Lodge No. 415, the Shriners, and a founding member of the Classic Rollers Antique Car Club. He attended Amarillo College receiving two Associate Degrees in Applied Science for Diesel and Automotive Mechanic; and completed continuing education courses for Small Gasoline Engine Repair. In later years, he attended West Texas State University’s Energy Training Division to complete an Ancillary Equipment Workshop. Lastly, James attended Amarillo School of Vocational Arts for Automotive Transmission repair. He was a collector of antique cars and could restore and rebuild them because of his educational background. He retired from the City of Amarillo Rick Husband International Airport as a Building Mechanic after 20 years of service. James was preceded in death by his parents, his loving wife of 56 years, a daughter, Vellgena Junique McGhee, a brother George Franklin and a sister, Jessie Garrett. James leaves to cherish his memories a daughter, Eli Wynona McGhee-Davis (Fredrick), two grandchildren, Brittani Javel McGhee-Smith (Gregory), and Genekristopher McGhee-Anderson, five great-grandchildren, Tayjanna Geneice McGhee-Pleasant, Germani Nicole Smith, Ty’Ryiah Anderson, Nalieyah Williams, and Jai’Toryion Sharise, two brothers Robert McGhee and Harold McGhee, a step-brother Jason Henry, a sister-in-law Estellene Jones, nieces, nephews, world traveling best family friend, Alice Marie Crawford, and a host of loyal and loving friends.